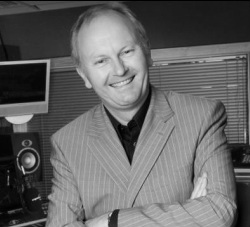 "Born and raised in Cheshire, my career in radio began at Manchester's Piccadilly Radio in November 1978 where I cut my teeth as a presenter in the dead of night before going on to host the station's famous 'Rock Relay' show for two years. As one of only four 'Rock Jocks' in the UK at that time I got to interview many of the big names including Meatloaf, Ian Gillan, Mark Knopfler, Rick Wakeman, Steven Tyler, Phil Collins, David Coverdale and Elton John. Following a spell as Head of Music and Features at Leicester's first commercial station I joined Signal Radio in Stoke-on-Trent in 1983 presenting the 'flagship' Breakfast Show from Day One. After a three-month 'sabatical' hosing the Early Show at BBC Radio 2 I was promoted to Programme Director at Signal where I remained for a total of 22 years. During that time I hosted Commercial Radio's first sponsored 'live' outside broadcast from Stafford's twin town in Germany and introduced the 'Labatts' brand to the UK in a sponsored 'Canada Day' show from the studios of CFTR in Toronto. I also devised Britain's first 'adult rock' format, 'ECHO 96', before successfully 'splitting' Signal Radio into 'Signal 1' and 'Signal 2'. When Signal was acquired by Kelvin MacKenzie's Wireless Group plc in 1999 I took on a senior group role and was later promoted to Director of Programmes with responsibility for devising and executing all programme strategy across the group’s 15 local & regional radio stations in the UK. This key role encompassed maintenance of on-air standards, talent recruitment and training, audience research, marketing and regulatory compliance. TWG was sold to UTV Media in July 2005. In 2006 I joined Canadian media 'giant', CanWest, to oversee the launch of a new 'adult rock' radio station for the Solent region. The station was launched to industry acclaim – on time and on budget. Promoted to Managing Director in 2007, I became responsible for the day-to-day management of all aspects of the station’s operation. The licence was acquired by Celador in 2008 and subsequently re-launched as 'Jack FM'. In September 2008 I teamed up with former Piccadilly Radio colleague, Steve Penk, to work on the re-launch of his first acquisition, 96.2fm Revolution Radio, in north Manchester. The very week Steve took control, Lehman Brothers filed for bankruptcy protection and recession became a reality. The global economic downturn has hit hard, presenting commercial radio with unprecedented challenges leading to widespread consolidation and the disappearance of many formerly successful brands. The entire media landscape has changed and this chapter in my career has called upon all the experience of the last 30 years. We've had to make some very tough decisions in order to keep the business alive but remain confident in our proposition and, most importantly, the passion lives on! In August 2010 I founded a community radio group in my home town, Skipton, and since then have been working 'under the radar' to establish relationships with key members of the local community. The response has been overwhelmingly positive and our social media following bears testament to the need for a dedicated station. 'Radio Skipton' submitted an application for an FM licence in January 2013 and we are currently awaiting Ofcom's decision. We relish the prospect of bringing 'hyper-local' radio to Skipton in the coming months." David has 25 years commercial experience gained from both inside and outside of radio. I first came to radio in 1981 as a freelance presenter with commercial radio station Essex Radio and was hooked. I then spent the next 15 years work in a variety of senior commercial roles for various leading American IT manufacturers before returning to radio in 1997 as a Non-Executive Director of Wire FM in Warrington, Cheshire. After we successfully sold the company to The Wireless Group in 1999 I returned to the IT industry establishing my own software consultancy. In radio the bug never leaves you so in 2004 I authored Cheshire FM’s licence-winning application and became CEO - launching the station in 2006. In 2008 I was approached to take on a failing radio station in Merseyside. I formed a business consortium and led the acquisition and turnaround of commercial radio station Dune FM in Southport. In january 2010 we doubled the company's size by acquiring neighbouring station, Central Radio in Preston, Lancashire. Both radio stations were successfully sold in 2011. Since then I have been working in an advisory capacity for businesses and was most recently VP of Sales for an international digital solutions company. Sophie is a creative director, brand consultant, and marketing and social media expert. I show businesses how to integrate content marketing, digital media and social technologies into their business strategy. I have worked across many industry sectors including FMCG, energy and utilities, telecommunications, leisure and tourism, healthcare, technology, professional services, membership organisations, financial services, education, public sector and non-profits. Prior to joining Niocast I ran my own marketing consultancy. My role is to bring in-depth insight into how digital communications can support the delivery of corporate strategy, enhance business performance and facilitate stakeholder (employee) engagement.